Denmark joins several other European nations restricting face coverings. France banned the full face veil in 2011, while Belgium, Austria, the Netherlands and parts of Switzerland have restrictions in place. Other European countries have debated the issue. 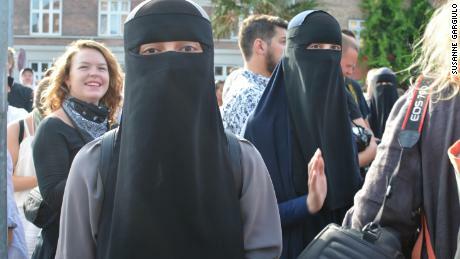 The Danish law was passed in May and came into effect Wednesday, meaning people found wearing facial coverings in public could be fined from 1,000 Danish krone ($157), for a first offense, up to 10,000 krone ($1,565) for a fourth violation. Several women wearing niqabs — which fully cover the body but leave the eye area open — said this would make it very difficult for them to leave their homes, whether to take their children to school, grocery shop, or just move around their communities. The burqa covers the entire body and has mesh in the eye area. A Muslim protester — Sabina, who gave only her first name and wears a niqab — said it would have “huge consequences” on her life. “Every time I step outside my front door, I am a criminal. I have to stay in my house, isolated. I cannot go to the grocery store, I cannot go out,” she told CNN. The ban has been ridiculed for its vague language — and for outlawing all facial coverings in public — despite its backers clearly stating that its real target is the Islamic face veil. Anything from ski masks and fake beards to scarves covering the face could be seen as illegal. Police said they would not enforce the ban during Wednesday’s protest because people had the right to demonstrate. Critics of the law also point out the small number of women who actually wear the veil in Denmark — only around 150 to 200 Muslim women wear the niqab or the burqa on a daily basis, according to a University of Copenhagen study. Muslims account for about 5% of Denmark’s population of 5.7 million. Sasha Andersen, a spokeswoman for the Party Rebels political group that organized the protest, called on the government to rescind the law. “It moves us in a direction that is far more discriminatory and it limits people’s freedom with something as commonplace as clothing,” she said. 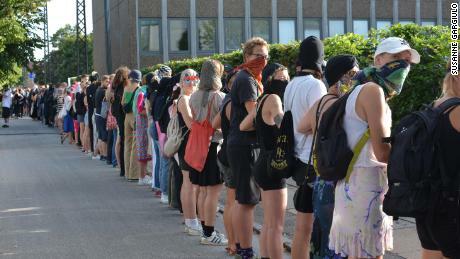 They formed a human chain around the large police station, as several police officers protected the building. Martin Henriksen, an MP from the Danish People’s Party, which proposed the ban, said he was very pleased with the progress of the law. “The burqua and niqab are the purest form of extremism. This is a battle again fundamentalism. As a society, we are showing what we are willing to accept,” he said. He added that in the future his party also hoped to see the banning from schools of Islamic headscarves that leave the face visible. CNN’s Angela Dewan wrote from London. Journalist Susanne Gargiulo reported from Copenhagen.